The PlusX design revolves around an internal antenna and side-profile design that contribute to overall durability and a streamlined appearance. This minimal design aesthetic is also benefitted by the simplified connection strategies that allow the radio to be fully functional when attached to a camera's hot shoe, without any cabled connections required. For attaching to remotes and external lights, a 3.5mm miniphone socket is available and three cables are included to offer an array of popular connection types. The PlusX features 10 standard channels for use to provide greater availability when working amongst other photographers or for greater control over complex lighting situations. These channels are compatible with all other PocketWizard of the same frequency. An analog dial is used to quickly and easily switch between the 10 available channels. A full-time amber backlight is used to illuminate the selected channel for convenience and greater visibility when working in dimly-lit conditions. A tri-color LED is also incorporated into the design and provides a visual means for gauging the PlusX battery life when it is sending or receiving a transmission. The PlusX is automatically set to intelligently and instantly switch between transmitter and receiver modes for the greatest amount of flexibility. You can also manually override this function and choose to have it act as a dedicated transmitter only, which will cancel its ability to receive or relay signals. Box Dimensions (LxWxH) 5.2 x 4.1 x 1.8"
PlusX Transceiver is rated 4.7 out of 5 by 245. Rated 4 out of 5 by Frank from The economy wizard For a long time I've been trying to save up for PocketWizards, and as many already know of the Pocket Wizard to have such an elite reputation , fortunately the brains behind Pocket Wizard decided to create an affordable device, the Plus X transceiver that wont cost you an arm or a leg. From the little conveniences of rubber test buttons buttons, to having the option of up to 10 channels to work with, the PocketWizard Plus X is very simple to use, and can affordably be found in B&H's store for less$ I highly recommend this to anyone looking to get into off camera flash photography, or and have been in the same predicament as me. Rated 5 out of 5 by The Night Cycler from Extremely light and easy set up Very basic with limited options in comparison to the Plus III, but it does what it does very well and is great for those that don't need all the uses of a Plus III or similar. I use this as a receiver and a Plus III as the transmitter. It does the job well and setting it up is very easy. Just one gotcha - I have a Nikon SB700, and I didn't realise when buying this that I would need a separate part to be able to use this with it. Tf you want to use this with a SB700, then you will need a PC to Flash Hotshoe Adapter, (the Nisha Hot Shoe/Tripod Mount is available from B&H) The construction seems to be good and it is extremely light. Rated 4 out of 5 by Rob from Plux X Transceivers I have used these to fire multiple speedlights as well as a studio light in the context of a wedding shoot. It is great to not have to use cords! I love the reliability and the range these have. So far I haven't had any problems with battery life, but I'll need to use them harder to see how long they can last. I wish they didn't fall sleep so easily. On my speedlights I have to fire once to wake it up, and fire again for the actual flash to go off. And of course, I wish it had TTL. But overall, a wonderful reliable product! Much better price than the Plus 3's, but still all the functionality I need! Rated 5 out of 5 by B-Photog from Simple yet Fantastic I use these PocketWizards for both off-camera speedlights as well as studio strobes. They are ridiculously easy to use: you turn them on, set the channels, and they simply work. If you don't need some of the more advanced features of the Plus III (e.g., zones, relay, etc. ), then these are well worth purchasing. If you want to remotely trigger your camera and flashes, you simply set your camera channel to one channel and your flashes one channel above and they automatically fire. These are priceless when it comes to off-camera flash and I have never had a no-fire situation. These simple radio transceivers by PocketWizard pack and punch! Rated 5 out of 5 by Paul from Does what it's supposed to do. There are fancier and more complicated flash triggers out there. But the PlusX meets my needs. The PlusX is reliable, reasonably rugged and straight forward to use. With 10 available channels, it allows me to shoot in environments where other photographers are also firing triggers. Since I do all of my strobe shooting in manual mode, I don't have need for the more expensive and complex TTL options available on the market. I also like the fact that it uses AA batteries which I always have on hand, instead of the more unique batteries that are required by some other triggers. I own three PlusX transceivers as well as a Plus III which I bought before the PlusX came on the market. The Plusx is a great product and serves my purposes. Rated 4 out of 5 by Ronald C. from Affordable quality I use multiple Nikon SB900 flashes regularly that I triggered from my Nikon camera's built-in wireless flash but the SB900 still had to see the camera flash. It was not reliable unless used at close range and/or the environment was relatively dark. The PocketWizard Plus X are currently the most affordable PocketWizards available. They are very reliable as they triggered my Nikon SB900 flashes every time where my Nikon camera's built-in wireless triggering would normally fail. I prefer manual settings so TTL capability is not my cup of tea however, changing power settings at the camera would have been beneficial. A good example of the pros and cons of using the PocketWizards Plus X is outdoors under several tents during the day into night. Pro-Reliable Triggering. Con-Changing the power settings of each flash under each tent when required. Rated 5 out of 5 by Steven C from Excellent System For the Price For anyone looking to trigger strobes, flashes, or cameras, I would highly recommend this product. For the price, I don't think you can beat it. I was previously using radio triggers to fire strobes, but there are a lot of noticeable differences between the PW's and radio triggers. Probably the biggest difference I've noticed is that the PW's do not randomly trigger themselves off. When I previously had the radio triggers, they would randomly fire; sometimes they would not fire altogether... if you have the money, I would really look into purchasing a set of these. You will not be disappointed. Rated 4 out of 5 by qbert from Does the Job well Radio links for studio flash photography are pretty much required for multiple flash setups. 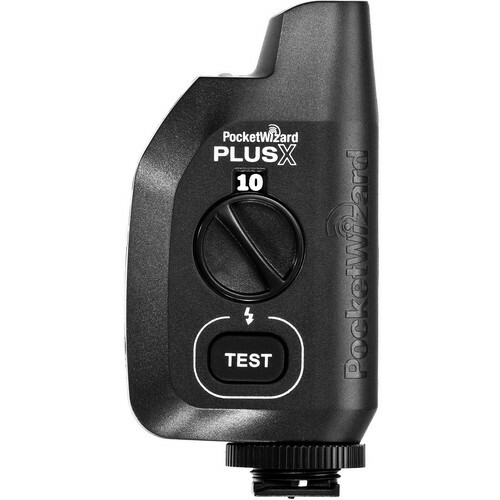 The PocketWizard Plus X is a solid unit with a very easy user interface. Plug into the flash, set the channel and turn it on. The unit is highly reliable and handles both transmit and receive functions and can trigger a shutter or a flash. My only complaint was the build quality of the plastic casing. It seemed a little cheap compared to older Pocket Wizard units I have. Also why don't they incorporate the attachment functionality of the caddy that is currently an add on from a 3rd party company. How is this product attached to a flash unit that is connected to a light stand? I have a Nikon D3200 and SB700 speedlight. I am new to remote triggers. So basically I am asking, do I just attached this to the camera and then the SB700 is automatically triggered? Or do I need to attach something to flash?Does this support TTL, or will the flash have to be in manual mode? To use the PocketWizard PlusX Transceiver to trigger the Nikon SB-700 Speedlight Flash off-camera, you would need two (2) PlusX Transceivers; one on the D3200 camera as a transmitter, and one connected to the SB-700 (via the PocketWizard HSFM3 Flash Sync Cable (3'), B&amp;H # WIHSFM3) as a receiver. The PlusX Transceiver is not capable of automatic i-TTL flash exposure. As such, you would have to set the output power on the flash manually. Will Pocketwizard PlusX work with all new profoto lights as well as elinchrom and is it compatible with their high speed sync functionality? The Plus X Transceiver can trigger Profoto strobes which have an intergrated Pocket Wizard receiver such as the Acute 2R system or Profoto and Elinchrom strobes that have another Plus X transceiver attached to them. The Plus X does not offer high speed sync. can I use with a pocketwizard plus2 ??? Yes, the Plus 2 is fully compatible with the Plus X.
I have a new 6D and a 430EXII and am looking to switch to radio flash triggers. I want one which will allow me to use the in-camera flash controls. Is this part of the TTL function as far as communication between the flash and camera? Which units would be compatible with my needs? Also, what do I need to connect the receiver to the flash? I am considering four of these to support my Bolt flash set and my Canon 5D Mark III. I'm getting conflicting reports from the web - maybe you can clear up.Is the Pocket Wizard Plus X compatible with the Mark III?Is it compatible with the TTL metering?How about ABC lighting control on camera?I want one on my 5D Mark III, one on my Bolt VX-760C and one on each of my 2 VS-510C's. Will I be able to use on camera settings to switch from AB to ABC lighting and have lighting control? The only PocketWizard remotes that use PocketWizard's ControlTL system to transmit TTL information is the PocketWizard FlexTT5 and MiniTT1 remotes. The PocketWizard Plus X is not a ControlTL unit and will not transmit TTL information; the flash output power would have to be set manually when using the Plus X Transceiver. As output power must be set manually, you cannot set AB or ABC ratios with the remote. You can normally trigger from one camera to another.. It is always best to set the remote camera to full manual-focus and exposure-for best results. And you will need the appropriate remote camera cable. However, the Sony S-VPR1-ACC cable is only fully compatible with the Plus III and MultiMAX. You may have limited compatibility with the PlusX but it is not officially supported.